Last night Chrome OS Beta Channel was updated to v.28. With this update came an updated File Browser, which on Chrome OS is called Files. The Updated interface comes with some much-needed interface improvements. For starters now you are able to drag and drop items into folders. Also notice in the screenshot above that there is another level for folders to appear. In the first version of Files you only had one level for the files and it was a little laborious to jump from folder to folder. Overall I think that this is a great improvement to the Chrome OS interface. Make sure to head over to your Files app on your Chromebook or Chromebox and check it out. If you have updated to v.28 what things have you noticed that are different? Let us know in the comments section down below. This entry was posted in ARM Chromebook, Chromebook and tagged chromebook, Computer file, File Management, File manager, google, Google Chrome, Google Chrome OS, Microsoft Office by James Arnett. Bookmark the permalink. 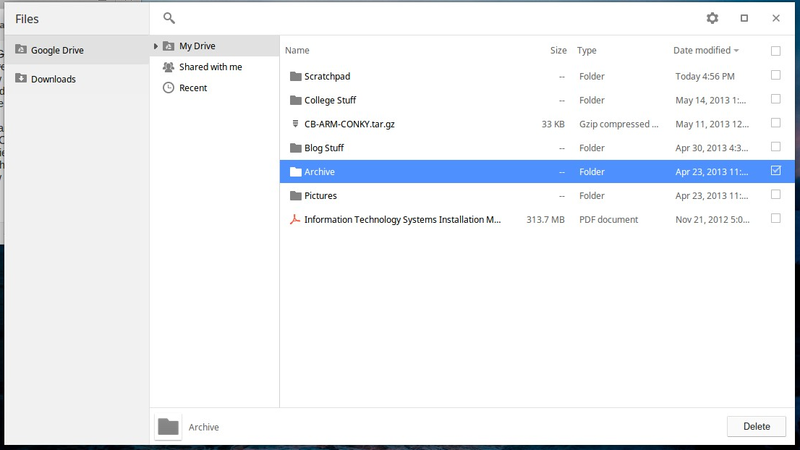 Updated Files App comes to Chrome OS v.28 on Chromebook so why don’t I have the updated version, please advise… or does it only work with google drive and not my other drives??? I am not sure on this one? Let me look into it and I will get back to you. What version is your Chromebook running? PS Are you a Veteran?